It’s pretty easy to get dressed in plain suits. 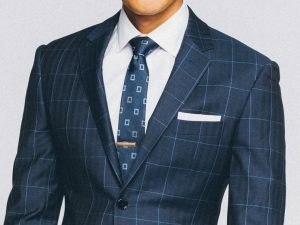 Patterned or printed suits are much trickier to pull off, but keep in mind these fashion tips and you’ll surely turn heads—for good reasons—anywhere you go. Pinstripe is the perfect business suit. It’s a style that’s very popular in the 1920s, but today it’s a little more refined. The key to finding the perfect pinstriped suit is in the stripes. Look for pencil-thin stripes as this gives you a more laidback yet stylish look. There are many different colours to choose from, but navy blue is the most recommended as its versatile, which you can wear from day to night. To complete the look, pair your pinstripe suit with crisp white button-down shirt and dark brown suede monk-strap shoes. This is perhaps the most flamboyant suit pattern because of its boldness. This type of pattern can be worn as sports and casual jacket or as a whole suit. 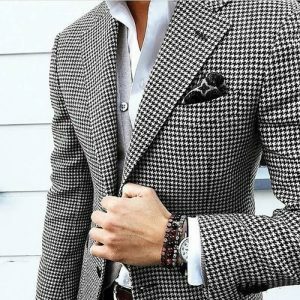 If you’re brave and feeling bolder, team your windowpane patterned suit with a gingham small chequered button down shirt. Paired with black loafers, a gray windowpane suit would be perfect for any meeting. This is an iconic suit pattern and is usually seen on blazers and sports jackets. Glencheck is very popular in colder months as it is often seen on woollen fabrics. 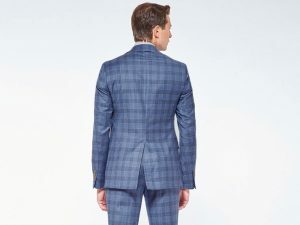 When dressing up a glencheck suit, it’s ideal to match it with a plain button down shirt instead of a printed or patterned one to avoid overdoing the look. If wearing a navy glencheck, a plain white shirt and black derbys would look exquisite. If going for a grey glencheck, a light blue under shirt and brown oxfords would be an ideal match. These patterns are often found on jackets and coats and on wool or tweed fabrics to give the material a luxurious and thick feel. A charcoal houndstooth suit looks just appropriate for the office. To complete your look, go match your houndstooth suit with a white button down and a pair of black brogues. Your printed suit is already the focal point of your look. So, avoid wearing more eye-catching pieces if you don’t want to look sloppy. Always keep your inner shirt simple. You can never go wrong with a crisp, white dress shirt. If you want to pull off a patterned-on-patterned look, pair a small-patterned suit (like thin stripes) with large-patterned shirt (like larger chequered). If the suit is in larger patterns, balance it with small-patterned shirt. Wear it with confidence. Being stylish isn’t just about the clothes you wear, but also about how you carry yourself. Patterned suits may be intimidating, but with the right know-how, you’ll realize that pulling it off is no rocket science. The next time you need to attend an event or a meeting, get out of your comfort zone and try this updated and sophisticated look.